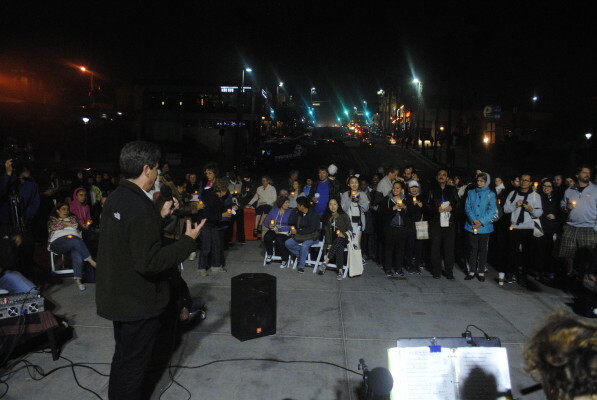 On March 29, over 500 people gathered on the Manhattan Beach pier and switched on their LED-powered candles in the name of Earth Hour, a community action to demonstrate a commitment to making Manhattan Beach a 100 percent renewable energy powered city by 2025. 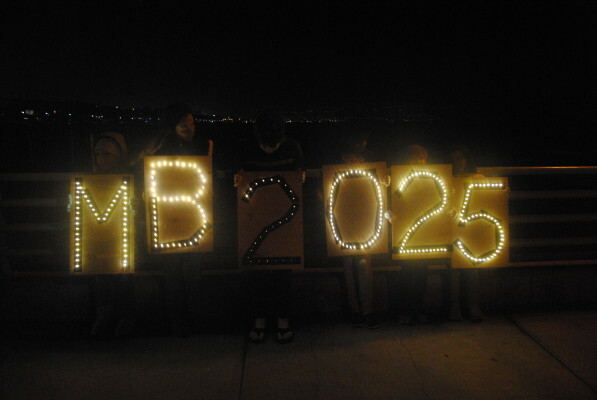 The candlelight action followed a two-and-a-half hour MB2025 forum at the Joslyn Community Center, where over 100 residents, environmental representatives, and elected officials listened to presentations by some of America’s leading environmental figures. Forum speakers included Chris Paine, director of “Who Killed the Electric Car?”; Paul Scott, founding member of Plug-In America; and Andrea Giancoli, policy analyst for Beach Cities Health District Blue Zones Project. Bill McKibben and Congressman Henry Waxman also contributed with personalized video speeches. Joe Galliani, the director of 350.org’s South Bay chapter, emceed the symposium. McKibben, a seminal author who has written extensively on climate change, sees hope for the future of Manhattan Beach. McKibben’s parents lived in Manhattan Beach, one block from the beach, as young newlyweds. He grew up hearing stories about playing volleyball on the beach, or walking up to Hermosa Beach to hear Gerry Mulligan play jazz at the Lighthouse Café. The city is part of a growing global movement toward the adoption of 100 percent renewable energy sources. Research conducted by Renewables 100 Policy Institute, a non-profit organization founded by Diane Moss — who also spoke at the MB2025 forum — shows that eight countries, 41 cities, 48 regions, eight utilities, and 21 non-profit/educational/public institutions have shifted or are committed to shifting within the next few decades to 100 percent renewable energy in at least one sector. These areas represent 43.5 million people who will soon be committed to renewable energy. Many local elected officials were in attendance, including former Hermosa Beach Councilman Jeff Duclos, who had recently returned from “climate reality” training with Al Gore in Johannesburg, South Africa; former Manhattan Beach mayor Portia Cohen; and Redondo Beach Councilman Bill Brand. Congressman Waxman received the first annual Climate Champion Award given by South Bay 350 Climate Action Group. Waxman expressed his gratitude in a compelling video speech. “I am grateful for the recognition you have given me and even more so for all the crucial work you are doing to protect the environment for our children and grandchildren,” Waxman said. 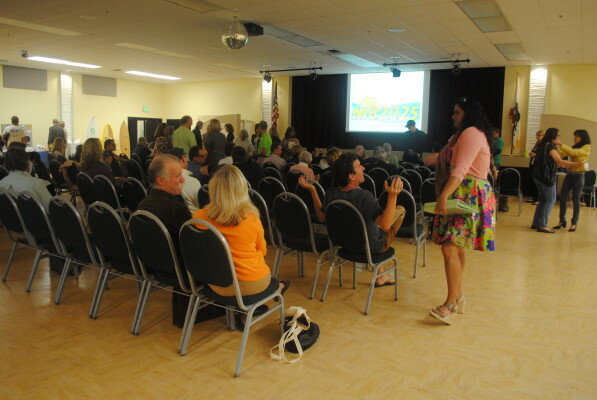 Many local and national organizations showed their support for the forum including Environmental Priorities Network, Surfrider, Environment Now, Plug-in America, League of Women Voters, VOICE, Sustainable Surf, Sierra Club, and South Bay Bicycle Coalition. The pier festivities were documented by ABC 7 television but also by a flying drone camera that buzzed around the pier. Scott Stiles from New Media Consulting provided the drone camera and captured special aerial shots and video of the event. “It was a smash success,” said Galliani. “My hope was that the city would see the merit in it, and want to move forward with it, and that’s exactly what they’re saying now.” The City Council, Galliani says, is currently making plans to meet with energy specialists and intends to draft a resolution to make Manhattan Beach a fully renewable energy powered city.